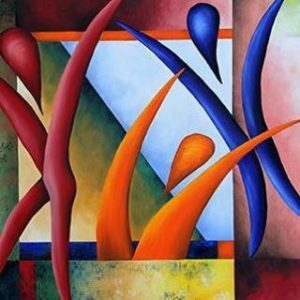 I studied art at Belleville Area College and finished my bachelor’s degree at Illinois State University with a comprehensive major in Art and Art Education. After graduating from college I went to work for the Department of Defense at Scott Air Force Base. I worked for 34 years as a graphic illustrator and multimedia manager. Since retiring I devote my time to creating my art. After completing college with a bachelor degree in art from Illinois State University, I spent 35 years working for the Air Force as a graphic artist. During this time I continued to hone my painting and drawing skills. Since retiring, I devote my time to painting and drawing. I find inspiration in nature and machines. I explore the relationships between opposites; strong vs. gentle, hard edge angular forms vs. soft flowing forms, smooth vs. textured surfaces, bold vs. subdued, and color vs. shades of gray. My paintings and drawings focus on contradictions and how they converge and can exist in harmony. October 19, 2013, 9 a.m. to 5 p.m.
October 20, 2013, 11 a.m. to 5 p.m.